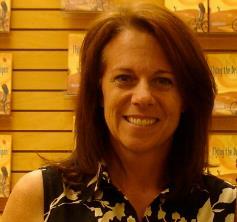 Today, MoAA presents superawesome author Natalie Dias Lorenzi! Natalie Dias Lorenzi: When the words flow from brain to fingertips to keyboard. NDL: Staring at a white screen with a blinking cursor and no words flowing from fingertips to keyboard. NDL: …entering another world, but one where I get to call all the shots. At least that’s what I’d like to think…lots of times it feels like my characters are the ones calling the shots. NDL: In a tree house! I once read an interview with a famous children’s author who writes in a tree house in her backyard. It was gorgeous and rustic, with a porch. I think it would be the most peaceful place, yet not too distracting. If I were in some exotic locale, I don’t think I could concentrate on writing. 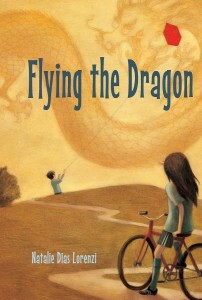 NDL: I’ll choose five from some of the reviews that Flying the Dragon has received: moving, poignant, heart-warming, tender, and entertaining. NDL: The climbable kind—thick branches, with colorful leaves in fall and blossoms in the spring. We have a cherry tree near our front yard that’s perfect for climbing. NDL: Shy in situations where I didn’t know anyone, but outgoing with friends. NDL: Be true to yourself, in your writing world and otherwise. It’s easy to be swayed by trends in the publishing world, and while it’s fine to keep them in mind as you create stories, write the stories that speak to you. If do, you’ll have written a story that speaks to your readers. NDL: 1. Visit Australia and Antarctica to round out my seven-continent tour—I’ve already been to the other five, having lived in North America, Europe, and Asia, and visited South America and Africa. 3. Publish more books for kids! Natalie Dias Lorenzi is a traveler, writer, wife, mother, and librarian, not necessarily in that order. In addition to writing for children, she is a freelance magazine writer and contributing writer to Scholastic’s Instructor magazine. She lives in Virginia during the school year and Trieste, Italy in the summers. Visit her at www.nataliediaslorenzi.com. This entry was written by Lesley Fairy and posted on July 29, 2013 at 7:00 am and filed under Interview. Bookmark the permalink. Follow any comments here with the RSS feed for this post.